Johnny & Associates is a Japanese talent agency, formed by Johnny Kitagawa in 1962, which trains and promotes groups of male entertainers known as Johnny's. Hikaru Genji was a Japanese musical idol group named after the character Hikaru Genji of The Tale of Genji. They were managed by Japanese talent agency Johnny & Associates from 1987 to 1995. Yokohama Arena is an indoor arena located in Yokohama, Japan. The capacity of the arena is 17,000 and was opened in 1989. The arena was modeled after US sports venue Madison Square Garden in New York City. 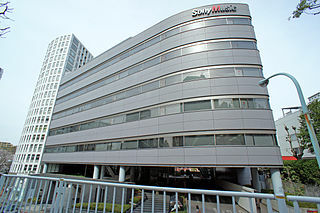 It is a five-minute walk from the closest station, Shin-Yokohama Station on the JR/Yokohama Municipal Subway. A Album is the debut album of the Japanese group KinKi Kids. It was released on July 21, 1997, on the same day as their debut single "Garasu no Shōnen". The album debuted at the top of the Oricon charts, selling 315,330 copies in its first week. It was certified Million by RIAJ and is currently the duo's second best-selling album. Domoto appeared in the 2003 drama Moto Kare, in which he co-starred for the second time with Ryōko Hirosue after their hit drama Summer Snow in 2000. In April 2004, Domoto once again provided the theme song for his lead-role drama Home Drama. This year, he won the 'Best Jeanist' award. The following year, Domoto acted in a movie, Fantastipo, with fellow Johnny's personality Taichi Kokubun. He paired with Toraji Haiji to release the theme song for the movie. The same year, Domoto starred in Hoshi ni Negai o (a.k.a. Wish Upon A Star), a TV drama produced by Disney and Fuji TV based on the true story of planetarium engineer Takayuki Ohira who designed Megastar II – the world's most advanced planetarium projector. Ryōko Hirosue is a Japanese actress and singer, best known to international audiences for her roles in the Luc Besson-produced Wasabi and the Academy Award-winning Japanese film Departures. She also starred in the 2008 comedy series Yasuko to Kenji. Summer Snow is a Japanese television drama that was broadcast from July 7 to September 15, 2000, on TBS. It is a love story between a young man who has been forced to grow up too quickly, and a young woman with an activity-restricting ailment. The title refers to marine snow, which the two promise to see together one day. The series comprises eleven episodes. Taichi Kokubun is a Japanese keyboardist and actor. He plays keyboard for Tokio, a Johnny & Associates musical group. On April 6, 2011, Domoto released his ninth single, "Eni o Yuite", which was recorded at shrines believed to have connections to Nara's entertainment and music industries. Another single, "Niji no Uta", was released in September 2011. For activities as a member of KinKi Kids, see KinKi Kids § Activities. 1995 Hajime Kindaichi Episode: "Goodbye Ie Naki Ko"
1999 Yūji Tokieda Episode: "Missed Love..."
2001 Shoplifter Episode: "Goodbye Rookie Detective"
"SHOCK" (ショック) is a series of musical works starring Domoto Koichi, who is also in charge of the planning, music, story, and production under Johnny Kitagawa’s direction. SHOCK was originally based on the musical "PLAYZONE '91 SHOCK", and premiered at the Imperial Theater in November 2000 under the title "MILLENNIUM SHOCK". It has been performed at the same theater every year since, with different modifications in the title, cast, plot and programs each year. In 2005, it was revamped entirely as “Endless SHOCK”, which has been its title until now. SHOCK's annual performances are greatly anticipated, and it is dubbed “the stage of which tickets are the hardest to get in Japan” by the media. Kaori Asada, known by her stage name Bonnie Pink, is a Japanese singer-songwriter and musician. She writes and composes all her songs, and plays guitar and piano. Asada has said that the name Bonnie Pink is random and has no special meaning; she chose it because it was easy to remember and because she thought the words were cute together. Aside from her native Japanese, she is also fluent in speaking English, Korean and Chinese. Jun Matsumoto, often called by the portmanteau nickname MatsuJun (松潤), is a Japanese singer, actor, radio host, concertmaster, dancer and model. He is a member of the boy band Arashi, and produces Arashi's concerts. He invented the moving stage in 2005 which has been subsequently used by several Asian musical acts. He is best known to Japanese television drama audiences for his portrayal as Tsukasa Dōmyōji in the Hana Yori Dango series, in which he won GQ Japan's Man Of The Year Award under the singer/actor category for his work in the drama. Exile is a 19-member Japanese boy group. The leader of the group is Hiro, who debuted as a member of Zoo under For Life Music, but Exile has released their singles and albums under Avex Group's label Rhythm Zone. Hiro and Avex's president Max Matsuura came from the same high school. Kazuya Kamenashi is a Japanese idol, singer–songwriter, actor, television personality, producer, radio host, and occasional model. Born and raised in Edogawa, Tokyo, he joined the Japanese talent agency, Johnny & Associates, at the age of 12. Erika Sawajiri is a Japanese actress, singer, and model, who appeared in the fiction Japanese television drama 1 Litre of Tears, playing the role of a girl who suffered from the intractable disease spinocerebellar degeneration (SCD). Tsubasa Imai is a Japanese retired singer, actor and dancer formerly in the Japanese agency Johnny & Associates. He joined Johnny & Associates in 1995 and officially debuted in 2002 in the duo Tackey & Tsubasa with Hideaki Takizawa. They are signed to the record label Avex Trax. Imai released his first solo single, "Backborn", on February 24, 2010. Tatsuya Ueda, is a Japanese idol, singer, and actor from the Japanese idol group KAT-TUN. Born in Kanagawa in Japan, he joined the Japanese talent agency, Johnny & Associates in 1998. In March 2006 he debuted as a member of the Japanese boy band KAT-TUN and is under Johnny & Associates management. The group's name was an acronym based on the first letter of each member's family name until the departure of Jin Akanishi in 2010, and Koki Tanaka in 2013. Junnosuke Taguchi left the band a well in 2016. After Tanaka's and Taguchi's withdrawal, Ueda took the T's for TaTsuya. As of 2016, KAT-TUN stands for Kazuya KAmenashi, TaTsuya Ueda, and Yuichi Nakamaru. Ueda is very athletic, and his favorite hobbies include Boxing and running. Jin Akanishi is a Japanese musician, singer, songwriter and actor. He has been active since 1998, first as one of the two lead vocalists of the popular J-pop boy-band KAT-TUN. Since the group's official debut in 2006, they have achieved 14 consecutive number ones on the Oricon charts. In 2009, Akanishi started his solo career, and since then has released two studio albums, and two mini albums. Hey! Say! JUMP is a nine-member Japanese boy band under the Japanese talent agency Johnny & Associates. The name "Hey! Say!" refers to the fact that all the members were born in the Heisei period, and JUMP is an acronym for "Johnny's ultra music power." Toraji Haiji was a temporary idol unit formed in December 2004 by Taichi Kokubun of Tokio and Tsuyoshi Domoto of Kinki Kids. The unit was created to promote the 2005 comedy film Fantastipo, which stars Kokubun and Domoto. Fumi Nikaidō is a Japanese actress and fashion model. Tomomi Ogawa, known for both her full name or by her stage name Tomomi, is a Japanese musician, singer and songwriter. She serves as the bassist and backup vocalist of the Japanese rock band Scandal. She co-wrote most of their songs throughout the band's career. Japanese singer and songwriter Tsuyoshi Domoto has released ten studio albums, ten live albums, one compilation album, one cover album, one EP, and thirteen singles. His career began as a member of KinKi Kids. Domoto's first studio album, Rosso e Azzurro (2002), peaked at number one on the Oricon Albums Chart. ↑ キンキ13連続初登場１位をギネスが認定 (in Japanese). Nikkan Sports. January 3, 2002. Archived from the original on January 5, 2002. Retrieved June 5, 2010. 1 2 3 4 5 "Drama Academy Awards". Tokyograph. Archived from the original on January 29, 2010. Retrieved November 2, 2009. ↑ "1997 Million-Seller List" (in Japanese). RIAJ . Retrieved October 17, 2009. ↑ "Machi/Dekiai Logic" (in Japanese). Johnny's net. Retrieved November 2, 2009. ↑ "きみとあるけば". Asahi Shimbun. Retrieved April 7, 2013. ↑ "ずーっといっしょ。" . Retrieved April 7, 2013. ↑ "Tsuyoshi Domoto renames solo project". Tokyograph. January 31, 2008. Retrieved November 2, 2009. ↑ "Domoto announces first tour as ENDLI-x". Tokyograph. February 15, 2008. Retrieved November 2, 2009. ↑ "Nara TOurism Ambassador" (PDF). NaraCity. April 22, 2008. Retrieved April 22, 2008. ↑ "Charts: Tsuyoshi Domoto's solo project sells big". Tokyograph. April 15, 2009. Retrieved November 2, 2009. ↑ "Charts: Mai Kuraki, Tsuyoshi Domoto, Namie Amuro". Tokyograph. September 15, 2009. Retrieved November 2, 2009. ↑ "KinKi Kids Tsuyoshi Domoto to be Adidas New Campaign Model". musicjapanplus. Retrieved February 13, 2010. ↑ "KinKi Kids' Domoto Tsuyoshi to release new single in April". tokyohive. February 25, 2011. Retrieved April 14, 2011. 1 2 堂本剛、涙あふれた平安神宮ライブが映画化！堤幸彦監督と14年ぶりタッグで期間限定公開！ (in Japanese). Cinema Today. 23 January 2012. Retrieved 30 October 2018. ↑ 太一&剛のユニットが首位へ向け好発進! (in Japanese). Oricon. 26 January 2005. Retrieved 30 October 2018. ↑ “結成20周年”KinKi Kids、映画声優で初共演 (in Japanese). Oricon. 24 October 2013. Retrieved 30 October 2018. ↑ Schilling, Mark (5 July 2017). "Gross-out gags make 'Gintama' a miss". The Japan Times . Retrieved 30 October 2018. ↑ "Stars set to return for second live-action 'Gin Tama' movie". Asahi Shimbun. 8 July 2018. Retrieved 30 October 2018. ↑ 堂本剛が初先生役 ＴＢＳドラマ (in Japanese). Nikkan Sports. 2 October 2001. Archived from the original on 22 October 2001. Retrieved 30 October 2018. 1 2 "Labor pains". The Japan Times. 6 July 2003. Retrieved 30 October 2018. ↑ 堂本剛のプライベートに密着 ドキュメンタリー『堂本剛の素』GYAOで配信 (in Japanese). Oricon. 28 March 2018. Retrieved 30 October 2018. ↑ "List of Best Jeanists". Tokyograph. Retrieved November 1, 2009.